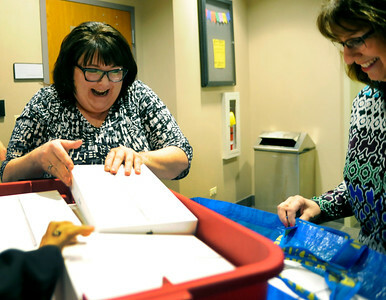 Gregory Shaver for Shaw Media Executive Director Kelly Weaver and Director of Development Lori Baker, of the Alexander Leigh Center for Autism look as some of the 40 iPads that are being donated to the center by the Chicago Autism Resource and Education group Tuesday evening, April 3, 2018, as the iPads and a charging cart are delivered to the center. The CARE group will be holding their Breaking the Silence fundraiser on from 12:00 p.m. to 8:00 p.m. Sunday, April 29, 2018 at Durty Nellie's in Palatine. The event is an all ages fundraising benefit hosted by Chicago's Original Rock band, VEILSIDE, to promote Autism Awareness and services needed throughout the autism community and to support Chicago Autism Resource and Education. 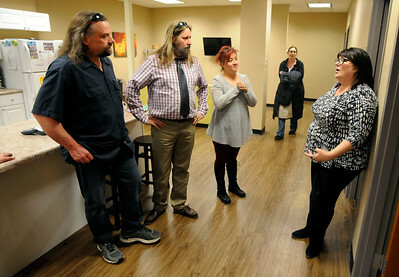 Gregory Shaver for Shaw Media Alexander Leigh Center for Autism Executive Director Kelly Weaver, right, gives a tour of the center to members of the Chicago Autism Resource and Education group Tuesday evening, April 3, 2018, as CARE donates 40 iPads and a charging cart to the center. The CARE group will be holding their Breaking the Silence fundraiser on from 12:00 p.m. to 8:00 p.m. Sunday, April 29, 2018 at Durty Nellie's in Palatine. The event is an all ages fundraising benefit hosted by Chicago's Original Rock band, VEILSIDE, to promote Autism Awareness and services needed throughout the autism community and to support Chicago Autism Resource and Education. 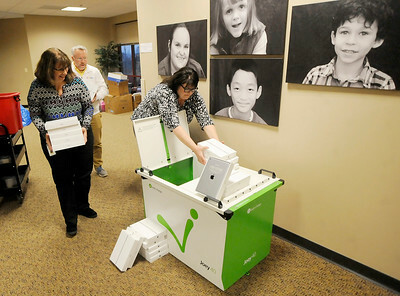 Gregory Shaver for Shaw Media Director of Development Lori Baker and Executive Director Kelly Weaver, of the Alexander Leigh Center for Autism unpack the 40 iPads and the charging cart that are being donated to the center by the Chicago Autism Resource and Education group Tuesday evening, April 3, 2018, at the center. The CARE group will be holding their Breaking the Silence fundraiser on from 12:00 p.m. to 8:00 p.m. Sunday, April 29, 2018 at Durty Nellie's in Palatine. The event is an all ages fundraising benefit hosted by Chicago's Original Rock band, VEILSIDE, to promote Autism Awareness and services needed throughout the autism community and to support Chicago Autism Resource and Education. 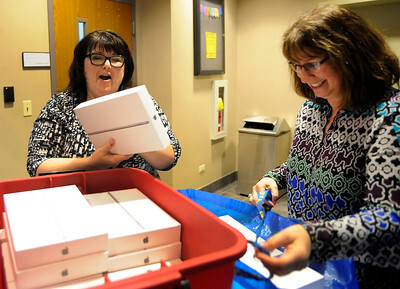 Executive Director Kelly Weaver and Director of Development Lori Baker, of the Alexander Leigh Center for Autism look as some of the 40 iPads that are being donated to the center by the Chicago Autism Resource and Education group Tuesday evening, April 3, 2018, as the iPads and a charging cart are delivered to the center. The CARE group will be holding their Breaking the Silence fundraiser on from 12:00 p.m. to 8:00 p.m. Sunday, April 29, 2018 at Durty Nellie's in Palatine. The event is an all ages fundraising benefit hosted by Chicago's Original Rock band, VEILSIDE, to promote Autism Awareness and services needed throughout the autism community and to support Chicago Autism Resource and Education.